The bilge and locker paint arrived which enable me to start briskly slapping it on. I chose white thinking it would improve visibility in the dark corners of the engine hole and lockers. 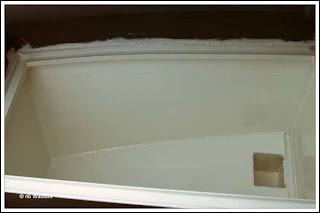 Darren, the boat painter, asked me if my painting ”drooped”?. Hell… Everything about me droops these days! 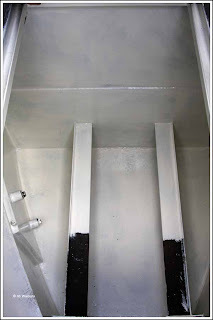 Only the bottom of the Bow Thruster locker has yet to receive a second coat of paint. The colour in the photo isn’t all that good. The white in the original photo came out blue because the cratch is covered by a blue tarpaulin. I fiddled with the colour settings in the computer program and this was the best I could do. A similar colour problem with the cratch locker. 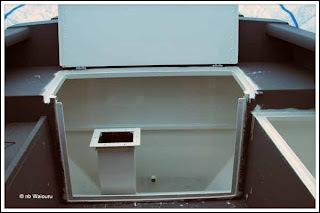 However you can at least see the small bilge pump sump. It’s required because the foredeck is below the waterline and therefore not self-draining. The port rear locker has only been given one coat of paint and as there isn’t any further white bilge and locker paint in the chandlery it will have to stay this way until later in the week. 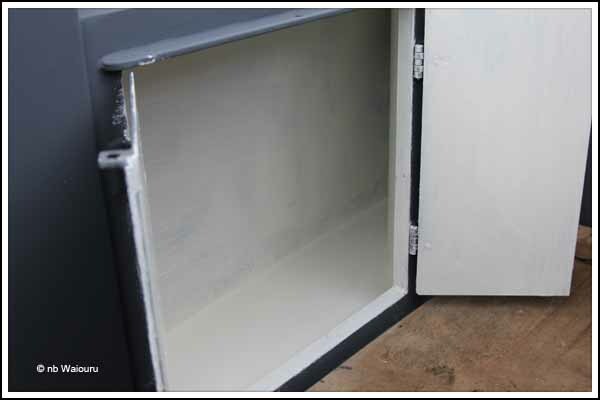 I haven’t started on the starboard locker (gas locker) as it has water in the bottom and some surface rust. I’ve already removed the bulk of the water with the wet/dry vacuum cleaner but the area needs to fully dry before I can tackle the rust. First coat in the engine compartment and no…… I didn’t run out of paint. The unpainted portion of the engine mounting rails is where I was standing to paint the floor. I surprised myself by being able to reach lower than my toes! As you can see I’ve been slopping the paint on with all the confidence of someone who doesn’t know what they are doing. Still, it’s all “out of sight – out of mind”. I've noticed that you have mentioned rust quite a lot recently and I wonder if you are making life too difficult for yourself. I worked for four years managing the restoration of two historic sea-going vessels (built 1872 and 1942). I'm not technical but I had a very experienced marine superintendant working with me. We had plenty of very heavy rust to get rid of. We used various methods, from hand chipping, to grit blasting, to ultra high pressure water; the method which they use for cutting concrete and much the best for heavy rust, but expensive unless you are doing big areas. The grit and water blasting produced an almost immediate, red bloom of flash rust. We painted straight onto this, with Dennis, the marine super, saying that it actually helped paint adhesion by giving it a key. 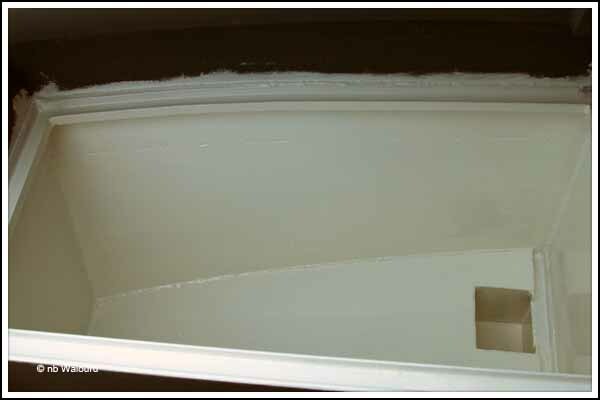 We were using International two part epoxy marine paint over the primer. Check with the technical department of your paint manufacturer, but you might be able to save yourself some worry and work! I hope you're right Graham as I've painted over some of the "flash rust" and am working on the principle I can always go back and paint another coat later should there be an issue!